The Dodgers didn't hit. Here's why: The majority of the Dodgers lineup was platooned during the game or, to put it another way, the majority of their hitters were pinch hitting each game.A hitter needs to get four at bats a game and they need to do that over a period of games. Each at bat builds on the previous one and the hitters eyes get used to the velocity and the movement, even if they are facing different pitchers. But the analytics say that x hitter does better against y pitcher therefore x hitter should bat. There is a long track record...but that track record is generally based on a hitter getting his four at bats. Granted, a team may generally pinch hit late in the game for, say, a weak hitting catcher at the bottom of the order. But a lot of Dodgers were being inserted pretty early. No continuity in a five game series. Red Sox didn't really hit either. Last edited by omg; 10-29-2018, 07:26 AM. your hypothesis is something that could only really be proven/refuted with analytics. i would phrase it this way: baseball managers overthink the post season to their peril. winning matters in the regular season too. if it was obvious that rampant pinch hitting and using 6 pitchers a game was the way to the best outcome, they would be doing that all the time. i doubt there was sound information behind a lot of those moves. its almost the *opposite* of making a decision based on analytics, imo. ... i doubt there was sound information behind a lot of those moves. ....its almost the *opposite* of making a decision based on analytics, imo. I saw it as mostly as having a righty facing a lefty and vice versa. The problem isn't the analytics, but not using them correctly. These things are painfully complex, and our brains cannot break them down to a simple formula. The only way, in my opinion, to improve this is to have every possible variable in a model (such as weather, number of at bats, etc.... basically waaaay more variables than can possible be considered useful), and find some deep learning or genetic algorithm to optimize them. This would be something that some of my colleagues could actually do if they had enough data. It is the incomplete analysis that probably is responsible. However, as with everything, chance may have just been bad, along with the fact that the Red Sox had better talent. i forgot the forum strips out smiley faces. my first sentence was intended to be tongue-in-cheek. correct, the righty/lefty thing is the sort of data point that they would have lots of information on. but, like you are pointing out, there is a lot more to it than that. there is more to consider than just righty/lefty. the problem isn't relying on analytics, it is giving too much credence to one particular data point. then again, i have spent my career in analytics and data so i am more than a bit biased. knowing that lefties are more successful against this pitcher tells you something. but what about lefty pinch hitters vs "hot" righty hitters? what about this particular lefty pitch hitter or the type of hitter he is? what am i giving up by taking the right handed hitter out? what is the likelihood that slot in the order will come back around? i don't really think all of that is considered when those decisions are made. Yeah well essentially that's what I'm saying. Not sure if I have this right as I'm going from memory but in the last game, with the Series on the line, didn't Cody Bellinger pinch hit for David Freese, who had gone 2 for 3, and who was the leading hitter in the Series for the Dodgers? I agree with you omg that hitters need to stay in the game. Very difficult to just pop in and get a hit. To me the right/left thing is overrated. The issue is smart/stupid. If a RH pitcher is so dumb that he throws 2SFB down and in to a LH batter, he is a moron. The tail goes straight into his bathead. I think when you get to good teams in the playoffs, most pitchers aren't stupid. The issue I see is that analytics is a measurement over a period of time and doesn't tell me squat about this at bat at this point in time with these runners on and this pitcher throwing. For example, Freese was hitting great and the analytics may have said that Bellinger was better in that spot over a years time, but Id rather stay with the hot hand. Same thing for the "new" swing in my opinion. Bellingers swing, or Joey Gallos may produce 50 homers and 150 strike outs over a season, but how many of those homers are empty, no one on late in a meaningless game? And how many of those strike outs are with runners on in an important spot? I tell my kids that with runners on, the first two are for you and the last one is for us. Go after the first two strikes with your best swing, if you aren't successful, the last swing better be productive towards the team. But yes, I definitely agree with you that hitters need to see pitches, and this constant PHing for "match ups" is way overrated, and will eventually bite you the longer you try to employee it. Heck, baseball players want to play (everyday, every inning), and the good ones walk out there with the mindset that they can hit anyone...lefty or righty...and when you start platooning them for a "better matchup", all you're really telling them as a manager is that you don't have the same faith in their ability when it comes to facing a particular handed pitcher as much as they do. Analytics actually say to ignore that hitter x has a certain history against pitcher y. Nobody who actually uses or understands analytics would ever suggest to use batter v pitcher matchups to make a decision. Also, there is absolutely no way to discern whether decisions based on analytics helped or hurt in a 4 game series. Everything is based on probabilities, and in a sample of 4 games, randomness is rampant. The dodgers could've made every single correct call in terms of probabilities and if they played 1,000 games would've won 700, heck or even 996, but with 4 games sometimes luck and proability are on your side and sometimes they arent. Anyone who blames a single win or loss in a 4 game series on analytics doesn't really understand the basics of statistical probabilities. And anyone looking to scape-goat "the numbers" and the "men with the calculators" is likely just casting blame wildly at things he dislikes or doesn't understand. to be fair, Moreland's 3 run HR was a pinch hit in Game 4 to bring the Sox within a run and Pearce's HR for the tie was also a pinch hit (and his 2nd PA was a 3-RBI double). If it works, you're a genius and if it fails you're an idiot. 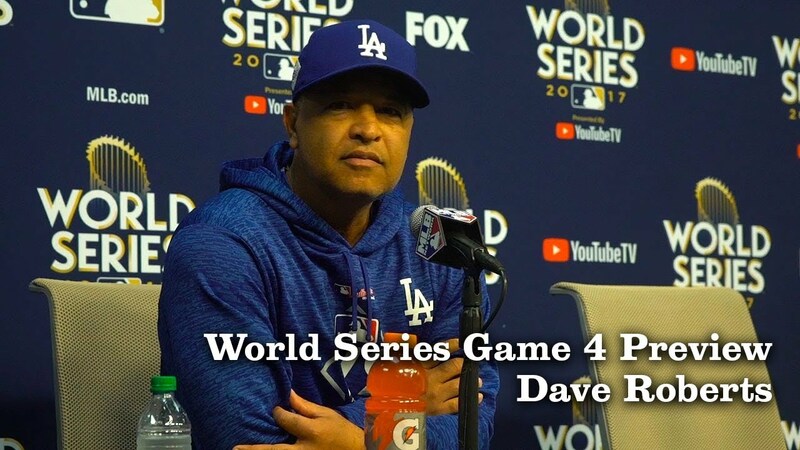 All in all, I don't think Dave Roberts was going to manage his way to beat the Red Sox, no matter how many scenarios we run through. Red Sox were a better team, consistent through the season, which the Dodgers were not. Really? Could you explain that? Likewise someone who disagrees with one mere aspect of "the numbers" doesn't necessarily disagree with all. But that's basic logic. Batter vs pitcher matchups are a small sample size of data because no single batter can face any single pitcher enough times to generate enough data to make a valid statisitcal probability on future outcomes. This is intro to stats stuff. I'm 100% confident, that anyone working for any mlb team in an analytical capacity would violently protest against anyone making a decision based on pitcher x vs batter y matchup numbers. Those kinds of decision are the 'Old school" baseball decisions which have no validity and are professed only by the people who disdain true analytical thinking.